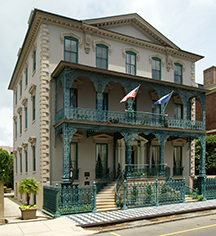 John Rutledge House Inn, a historic inn in Charleston, was built as a private residence by John Rutledge, noted signer of the U.S. Constitution and later Chief Justice of the U.S. Supreme Court. Historical records indicate that George Washington called here in 1791 and his diary shows an entry that he ate breakfast with Mrs. Rutledge. In 1836, the house was sold to the Right Reverend John England, Roman Catholic Bishop of Charleston. The home changed hands several times and was remodeled to include parquet floors, ironwork, and marble fireplaces. In 1902, the property passed to Robert Goodway Rhett, who was then the Mayor of Charleston. He was a frequent entertainer and it is rumored that during a visit by William Howard Taft, Rhett’s butler took the liberty of livening up one of the entrees and thus created She-crab soup, a favorite Low Country delicacy. 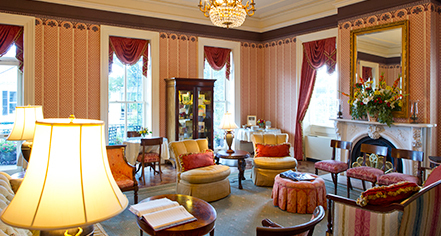 John Rutledge House Inn, a charter member of Historic Hotels of America since 1989, dates back to 1763.